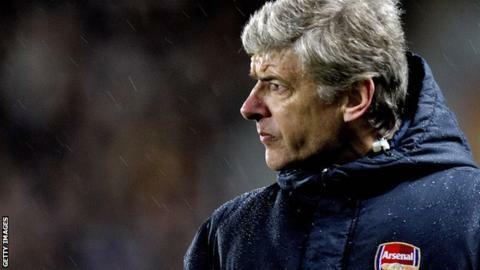 Arsenal manager Arsene Wenger says "he would cry" if the Premier League introduced a festive break. The Gunners play seven matches between 13 December and 16 January, including three games in seven days in December. "It is part of English tradition and English football. I want to go on with it," said Wenger. Manchester United manager Louis van Gaal called the lack of a winter break in English football the "most evil thing of this culture". United will have seven games between 12 December and 13 January, with three league fixtures in the space of nine days between 19 and 28 December. Previous research has shown players are more likely to suffer injuries in the second half of the season in leagues where there is not a winter break. Leagues in Spain, Italy, France and Germany all have a break at the festive period. "I have a lot of respect for Louis van Gaal, but I don't agree with him on that," said Frenchman Wenger. "Maybe I have been in England such a long time and had the same ideas as him when I first came. "The whole of Europe come to watch football on Boxing Day. It is an important part for us to being popular in the world. At Christmas, nobody works in the world and everybody watches the Premier League. "I would cry if you changed that. It is part of English tradition and English football. "I [would] always be pleased for a break after 1 January but we have to keep this tradition alive." Midfielder Aaron Ramsey has been ruled out for around a month with a hamstring injury suffered in the 2-0 Champions League victory against Bayern Munich. Boss Wenger was critical of Chris Coleman's decision to select Ramsey for Wales in the Euro 2016 qualifier against Andorra. "Maybe he was overloaded with games," added Wenger. "Both him nor Gareth Bale should have played because they were already qualified, but unfortunately I could not decide that. "I was in a position where I thought I could rest him against Watford I did not do it. Against Bayern we got punished. He should have had a breather." Asked if he regrets playing him in the 3-0 victory over Watford, Wenger replied: "Yes, because he got injured."